My trip to Interbike was quite different from previous years. I spent more time rushing from meeting to meeting than walking around looking at new products. And for the first time we talked to about as many shops who wanted to buy our products as manufacturers who make them. 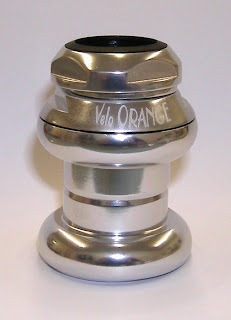 Another change is that we've shifted most Velo Orange buying to VO Imports, my new wholesale-only company, and we've started buying in larger quantities for the 50-odd shops that carry at least some of our products. Tom Martin, VO Imports' manager, and I met with several new dealers who were interested in stocking more VO products. We are adding 2 to 3 dealers a week so you may soon be able to buy VO and Grand Cru components and accessories at a local bike shop. There has been some progress on 50.4bcd VO cranks. That is, the project has move up the list to the point where the manufacturer is actually starting to work on the design and estimate mold costs, etc. We are moving ahead on the 50.4bcd chain ring project. Given the recent TA price hike this has taken on some urgency. It's possible that we'll have a new inverse brake lever next year that fits MTB and city size (22.2mm) bars. This project is just starting, no plans have been drawn yet, but a manufacturer is interested. We are looking into silver, double wall, eyeleted, VO brand rims in both 700c and 650b size. At this point we are simply exploring options, but if one of the manufacturers we spoke with can provide rims with the quality and at the price we want we'll have them made. Another project discussed is mid-priced wheels using currently available rims in both 700 and 650b sizes. These would be hand-built wheels, but available from stock. We still have to pick the best rims and hubs for the job. We are also planning hub dynamo front wheels. Our frame manufacturer is working on the last version of the VO production frame prototypes. There have been some more delays, which is very frustrating, but I'm still aiming to get these frames into production very soon. 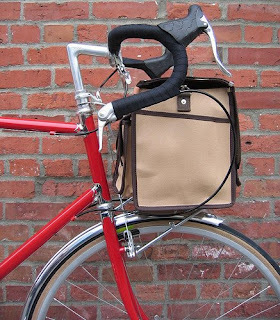 The VO handlebar bag design is finished and will soon be in production. The last hurdle is getting the right material for the interior stiffener; these little details take so much attention. The manufacturer thinks we'll have them around the end of the year. I'm off to Interbike for the rest of the week. So no more posts or e-mail until next week. Otherwise VO will be open and filling orders as usual, though the showroom will close at 3pm for the next 3 days. The photo is of my new Pass Hunter. It's just back from the paint shop and I can't wait to build it up as soon as I get back. The plan is to use as many VO components as possible. 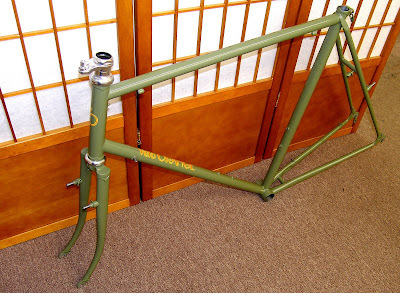 Currently the wait for Pass Hunter semi-custom frames is about 6 months and the price is $1550. 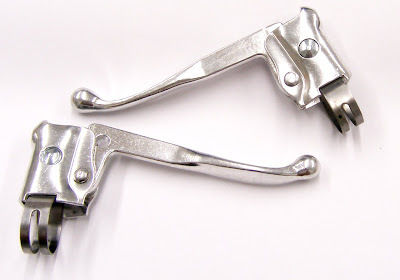 Many people have asked us where they can get old fashioned city bike levers, the type that CLB, and Mafac, and a dozen other companies used to make. They particularly wanted them in a size that would fit bars made from road bar tubing, 23.8mm. Our super popular Montmarte, and Left Bank bars, for example, are made with 23.8mm tubing so they fit bar end shifters. And we'll have two new 23.8mm bars this winter. This type of lever is still made, but mostly in low quality models for kids bikes and third-world markets. Most are heavy steel and have rust-prone zinc-plated mounting bands. Many are also too small for big western hands. We found what's probably the best model still made. They actually come from Taiwan, not China. 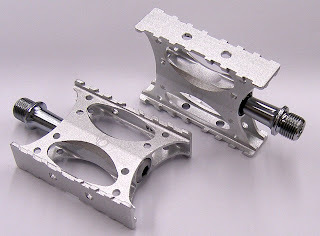 They are all alloy with good quality castings with a nice shiny finish. The manufacturer made them for us with a stainless steel clamp, which we think is a big improvement. But best of all they are available in both MTB (22.2mm) and road bar (23.8mm) sizes. So you won't have to scour E-bay or the back rooms of old bike shops looking for vintage levers. And the price? It's a hefty $11 a pair. One caveat though, they take the button type cable housing ends used on some BMX levers, not the common tube-type used on road bikes. Almost any bike shop will have them for under a dollar, but our shipment of cable housing ends is not due until next week. 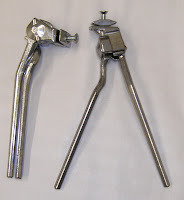 Also we now have the Pletscher double kick stands in stock. They are a fascinating bit of engineering. We also have some new aluminum city/MBT bar plugs and some new inexpensive expandable road bar plugs. 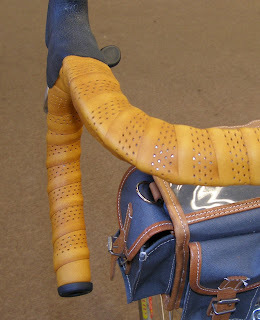 I've always loved the aesthetics of perforated leather, be it on old car seats, wheel covers, gloves... After a couple of tries we found a company that could make VO handlebar tape in a perforated version. It's soft, available in black or tan, and it's long enough for even a 46cm bar. And at $55 it's a lot less expensive than the Brooks version. The bearings can be replaced by simply dropping them into place, not be pressed in. This is a $40 headset that we feel is comparable to some that cost two, or even three, times as much. I'm proud of this component. Also, we now have the $19 VO loose-ball headsets in both JIS and ISO sizes. We have two new Velo Orange pedals as of today. Both use high quality sealed bearings. This means that the pedals require no maintenance or adjustment and the bearings will usually last longer than traditional loose balls. 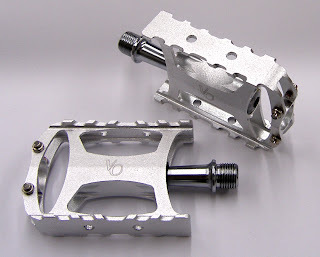 The bodies of both pedals are CNC milled aluminum alloy; even the dust caps are alloy. The Touring pedal platform is 90mm x 60mm. There are traction grips at the ends and the finish is sand blasted silver. The weight is am amazing 236gms per pair! Traditional touring pedals weigh much more, 397gms per pair for the MKS version. The second new pedal is the VO City pedal. Its platform is 82 x 60mm and the weigh is a svelte 228gms per pair. Both models have a small VO logo on the body. They do accept toe clips and come with snap-in reflectors. At $49 per pair we think they are a terrific deal. There will eventually be one more VO pedal, a road-type quill pedal. 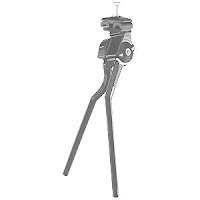 Our track pedal is already available. I hope they were worth the wait? Northern Europeans do a lot more commuting and city bike riding than we do. They are also, generally, wealthy and innovative folks. So it should be no surprise that there are numerous well designed modern accessories for city bikes made, or at least developed, in this part of Europe. Among of the accessories I was impressed with at Eurobike was the selection of racks specifically designed for city bikes. As a result we've decided to start stocking one, the Pletscher Master rack. It's a very well made Swiss rack with many features including a removable basket attachment. Make no mistake, these are not elegant rando racks, nor are they designed for massive camper loads and low-riders. Rather, they are modern, industrial looking, sturdy and functional racks that are ideal for shopping, commuting, and utility bikes. That little spring latch on top is perfect for holding down a few books or other items on the store. There is also an optional lock for accessories, but we won't stock that. 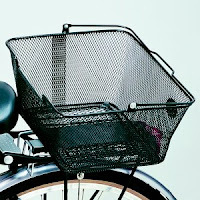 We will have the optional side rails which are only needed for very large panniers. A neat feature the ability to snap a shopping basket, or other accessory, into the top of the rack. 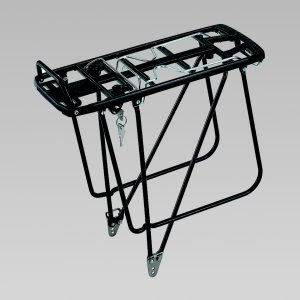 There are three little holes in the rack platform with spring clips that accept the basket. A snap-on hard shell case for cameras, and the like, is also available. The light bracket is drilled for JOS/Spanninga, or similar, tail lights. The platform is quite large, 395 x 142mm, and the eyelet attachment allows the rack to be leveled. Another item I was impressed with was the double leg kickstands. These are not cheap, but they are great for a loaded shopping bike. The racks, baskets, and stands should arrive later this week. We'll have a few other parts later. Are there other Euro-style accessories that should be available here? And will the rather "industrial" style of many modern European parts be well received here? I just got back from Eurobike in Germany. I also spent a couple of days sightseeing in Switzerland. Though Eurobike is a huge trade show, there really wasn't as much new stuff as I'd hoped to see. Show security was tight, as evidenced by the photo at left, but I managed to sneak a few photos. Highlights include the new Brooks natural saddles, as seen in the photo at right. They also have new white colored saddles. Cinelli is reintroducing their Unicanator saddles. I used to own one of these and still wince at the thought of having to ride more than a mile on it. No doubt these saddles are largely responsible for Italy's declining birth rate. In other saddle news, I examined the new Berthoud saddles with their light plastic frames and screws rather than rivets. They looked well made, if rather modern. Lepper had an interesting new line of leather saddles. these use a leather/latex foam sandwich construction on a traditional frame. They certainly look terrifically comfortable and seem to combine the best of traditional and modern saddle technology. We'll be ordering samples and looking forward to stocking them if they test well. The new Campy Super Record 11-speed gruppo was cool, though somewhat irrelevant. I looked at some promising new bike luggage that we hope to import. And we'll be considering bringing in some new city bikes. I have to be a little secretive about all this until details are worked out. I'd write more, but jetlag is catching up. A few more photos can be found here. I'm off to Eurobike in a couple of hours. Eurobike is a huge bike show in Friedrichshafen, Germany on Lake Constance. It's a part of Europe I've never visited, where Germany, Switzerland, and Austria meet. In fact my hotel is in a tiny alpine village in Austria about 45km from the show. The show itself cosists of 13 halls and over 930 exhibitors. I'm looking forward to chatting with some of the lesser know European manufacturers, espesially those involved with city and commuter bikes. I'm a bit of a fanatic about traveling light and am only taking my little Nokia 800, so I'll be able to read e-mails, but the touchscreen keyboard is too small to reply to the 50 or so e-mails I get everyday. I mention this partly because the Nokia 800/810 are super mini-computers to use on bike tours if you absolutely must stay connected. It also works as an e-book reader, stores all the maps I need, and the 810 has a built in GPS. So what specific products I should be on the lookout for? Photos of a few nice bikes made their way into my e-mail this past weekend. I thought you might also enjoy them. Tim sent photos of his stunning red new Davidson. "Your decaleur is installed on my new "Davidson," ... I rode the bike home, almost 1500 miles. It works great." More photos can be found here." 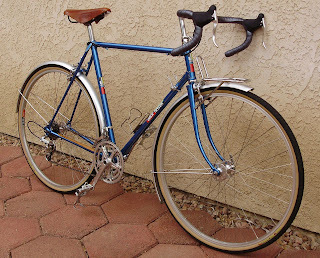 "This one is based on a Guerciotti, circa 1970-3, with unusually generous stay clearances and fender eyelets. It features a TA Bis 5 crank (a smaller inner ring is on order), Campagnolo Nuovo and Super Record derailleurs shifted by Simplex "loop" retrofriction shifters, MKS pedals, a JPR (?) 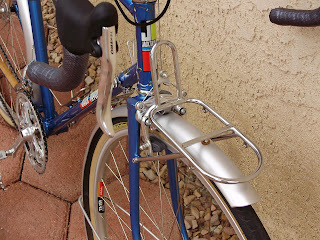 seatpost, Brooks B-67 saddle, Campy Pista headset, Campy NR bottom bracket, Nitto Stem, your handlebars and grips, Honjo fenders; and the world's largest bell. 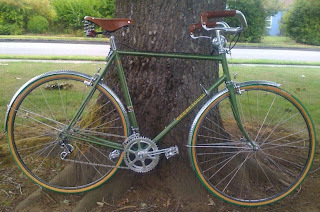 The tires are the wonderful Vittoria sewups, although it's a shame they're in a green that clashes with the frame. I'll be using it for my short commute to work.It's comfortable and fun, but I may eventually trade out the bars for something with less rearward sweep and use them with a lower stem. I may also mount the shifters on the stem, as it's a long reach to their current setting...."
Finally, Grant sent photos of his Jack Taylor. I've always been a fan of the Taylor brothers work, particularly of their French influenced touring bikes. "Just wanted to show how your products have helped me complete my Jack Taylor project. I am very pleased with the results. I purchased the surface-rusted frame this last February, had CyclArt renovate the paint and logos, and braze on attachments for the front rack. I then collected parts from various sources including eBay, local bike shops, and VO. This is a Tour of Britain model with 73 degree head angle and 2 5/8 (67mm)inches of fork rake resulting in low trail, so I think it will handle nicely with a VO handlebar bag when they become available. I believe I still prefer Honjo hammered fenders for their appearance, but many people have told me they love these VO satin finish ones, and am pleased with them also." I was informed by a couple of folks that Norman Taylor has recently died.